The Enzmann family in Switzerland, who developed the legendary Enzmann 506 fiberglass sports car (see below) also have a strong Jeep connection. 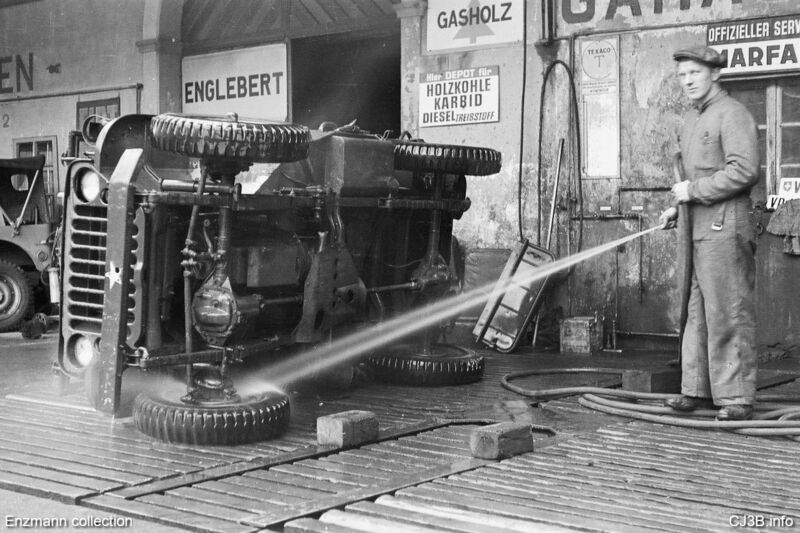 Shortly after World War II, family patriarch Emil Enzmann, Sr. expanded his garage business in Schüpfheim by importing some 60 surplus jeeps from France to the Entlebuch district in central Switzerland, where they were refurbished and sold to farmers. 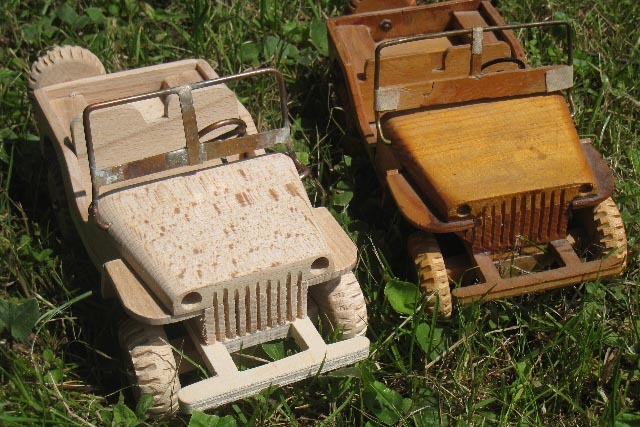 Kari Enzmann continues the story: "My grandfather had six sons; the eldest three were busy with the real jeeps and the youngest didn’t want to feel left out, so my dad drew a model of a Jeep on a scale of 1:17.5, and shortly afterwards the younger Enzmanns began their own production of model cars. 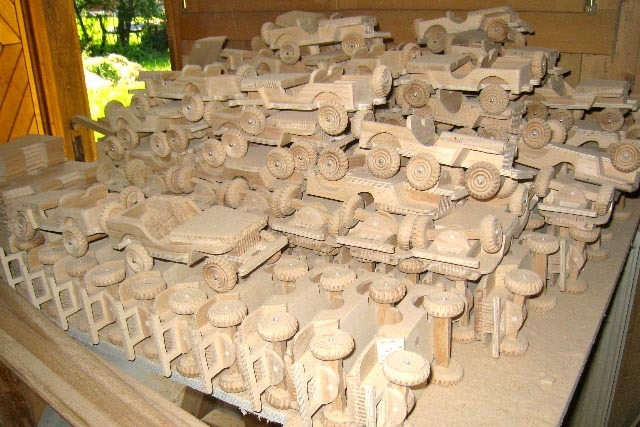 The models were sold either as kits or as finished models; over 500 pieces were sold between 1945-1949." 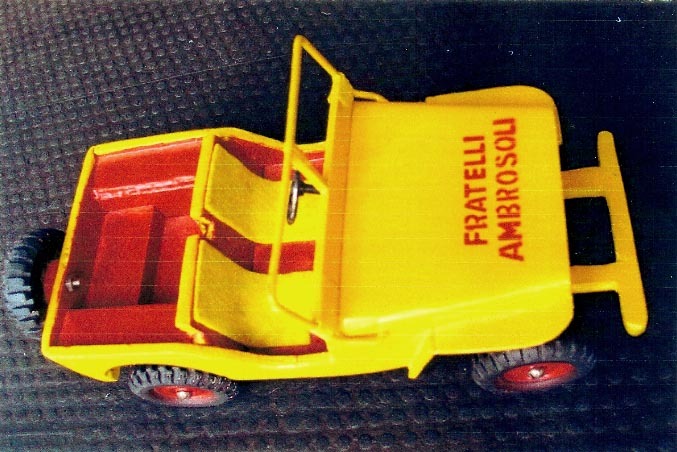 The owner of a toy shop chain didn’t want to pay what the youngsters thought the Jeeps were worth, so they sold most of the assembled, painted models to Fratelli Ambrosoli ("Ambrosoli Brothers") who had recently become the sole Willys importer in Switzerland. 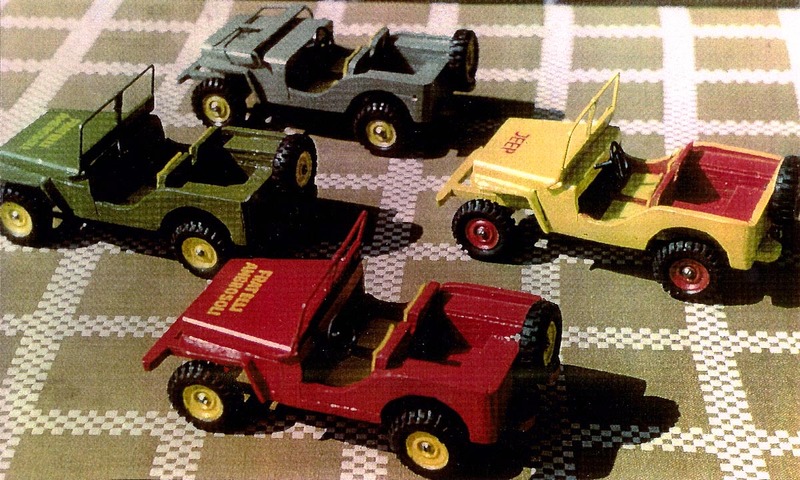 Pierino and Giannetto Ambrosoli used these colorful models as promotional gifts, and the idea helped to launch their business, which went on to sell some 20,000 Jeep vehicles over 30 years, through dealerships in Zurich (60K JPEG) and across Switzerland. 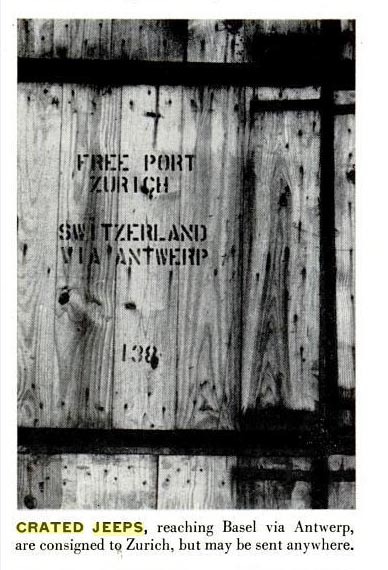 Interestingly, the Ambrosolis were at the center of a small controversy in the U.S. when LIFE magazine published a photo of a crated Jeep headed for Switzerland (70K JPEG) on 26 January 1953, as part of an article on American goods sold on the black market in Communist countries. Hickman Price, president of Willys-Overland Export, replied in a letter to the editor (90K JPEG) on 16 February, "We take strong exception to this implication of hanky-panky behind the Iron Curtain on the part of a reputable American company. The jeep... was destined for the Swiss army. 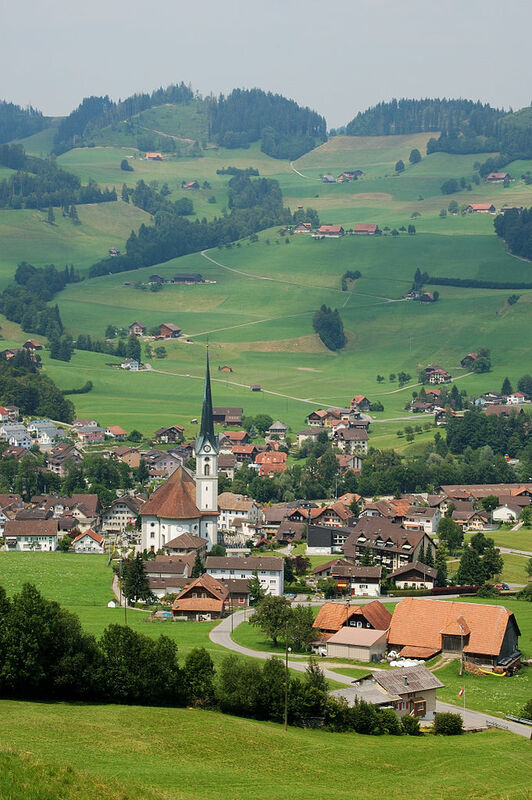 The consignee was our Swiss distributor, Fratelli Ambrosoli, Zurich." 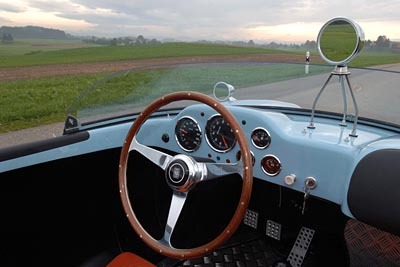 The replica (left) is almost identical to the original (right), including the soldered copper windshield and steering wheel. See also a side view photo (90K JPEG). It is sold unfinished, with a trailer, and the 2011 price including the trailer is 99 Euros. 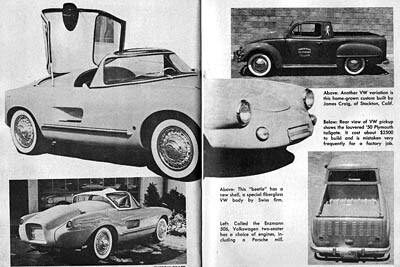 Meanwhile back in 1953, as the Ambrosoli brothers were scrambling to assure Willys that they were not selling any Jeep vehicles behind the Iron Curtain, one of the Enzmann brothers had turned his enjoyment of driving a jeep on mountain roads, into an interest in designing a sports car. 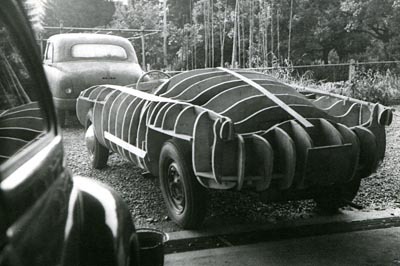 Kari's father, Emil Enzmann, Jr. had become a doctor, but put his woodworking skills to good use in building a wooden framework for the body of his design. 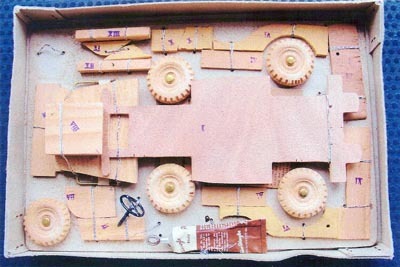 See also a front view photo (40K JPEG). 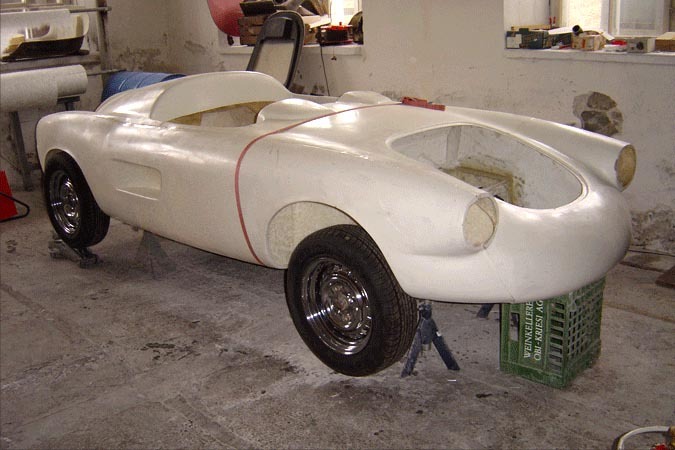 Emil wanted to make a safe but economical sports car, with good acceleration and easy handling. 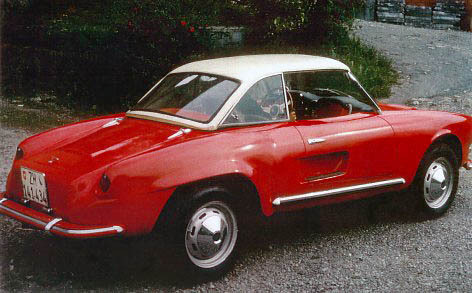 It would become the Enzmann 506, built on a VW Beetle chassis. The first body was aluminum, but Emil soon decided he and his brothers could use fiberglass, which was a novelty in the 1950s. To save weight while increasing strength, they gave up doors. 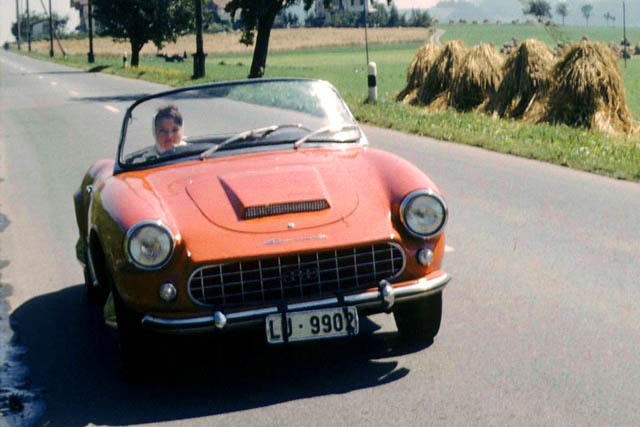 The first prototype was completed in 1956, and made its international debut at the 1957 Frankfurt Motor Show, where it picked up the model designation 506 from the number of the Enzmann display booth! 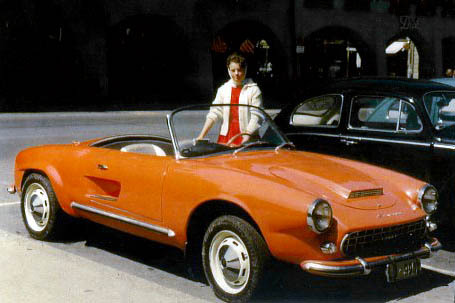 Total production between 1956 and 1969 was about 100 units, including Spider, Cabriolet and Hardtop models. Frames and engines were purchased from Volkswagen. 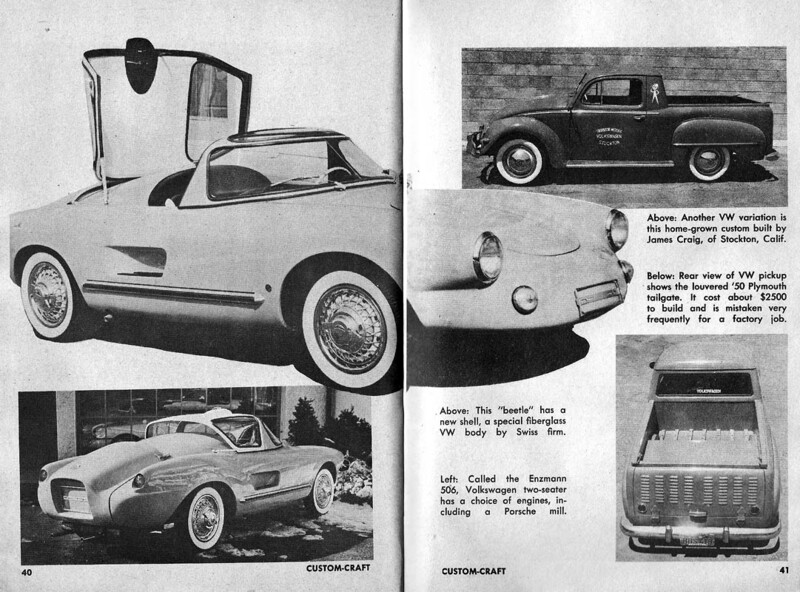 A feature on modified Volkswagens in Custom Craft magazine, 2 February 1960, shows a hardtop 506, as well as a couple of VW pickup conversions. 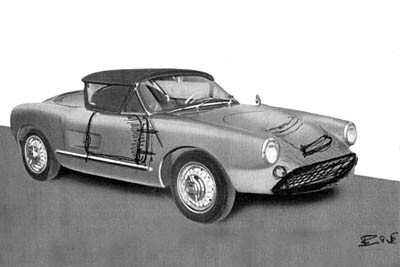 Some other innovative ideas in the 506 included a front seat passenger impact cushion, integrated roll bar, and ergonomically designed seats with lap belts. 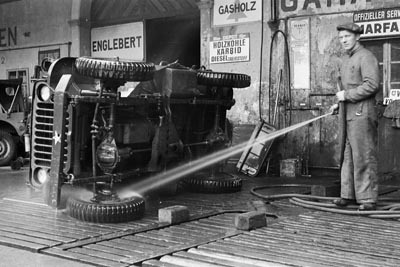 See an early advertisement in German (50K JPEG), promoting fiberglass for its light weight, resistance to corrosion, insulation of temperature and noise, flexibility and ease of repair. 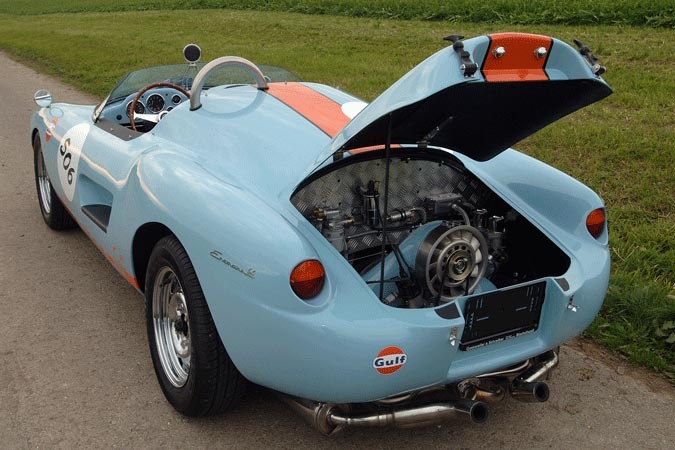 The 506 was much faster than the Beetle thanks to the lighter body, but also thanks to engine choices which included the Okrasa high performance engine used in some Beetles, or the Porsche 356 engine. 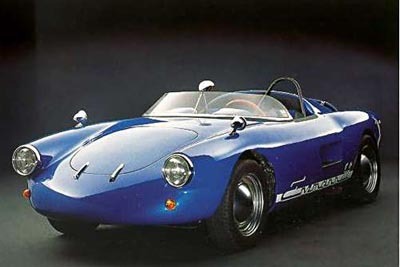 The cars had some success in racing, but production stopped because Volkswagen realized the Enzmann was a competitor for their Karmann-Ghia and declined to continue supplying the chassis. 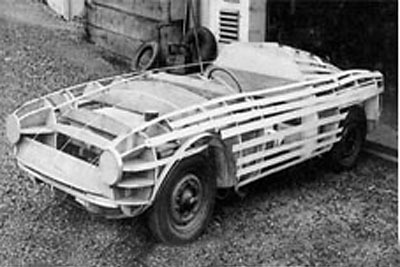 According to DKW Enzmann Story, Emil Enzmann considered using an alternative platform, and settled on a chassis from German automaker DKW. He updated the body design to adapt it from rear-wheel drive with the engine at the back, to the DKW configuration of front-wheel drive with the engine in front. This sketch of the modifications appears to be signed by "EE." 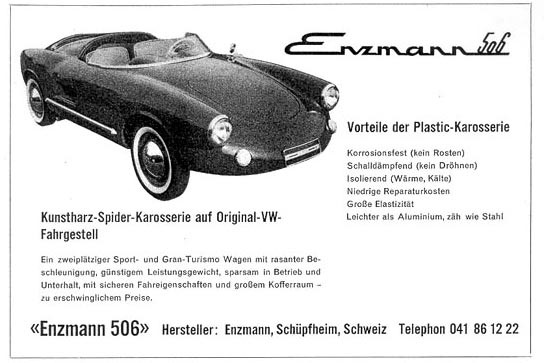 The new model was apparently going to be called the Enzmann 500. 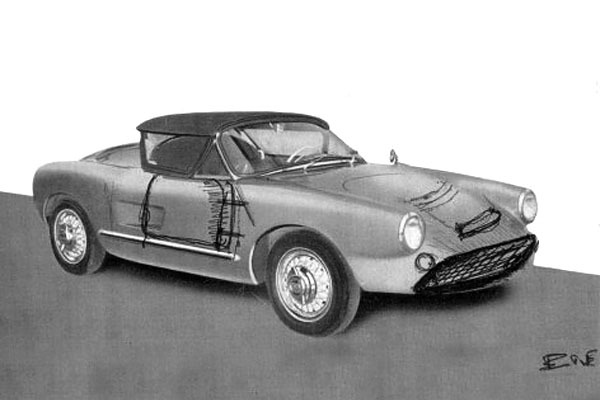 Although the DKW Enzmann 500 had similar lines to the Enzmann 506, it also had improvements including two doors and an extra emergency seat. But the number of 500's built was very small. See a side view and a rear view (40K JPEGs). 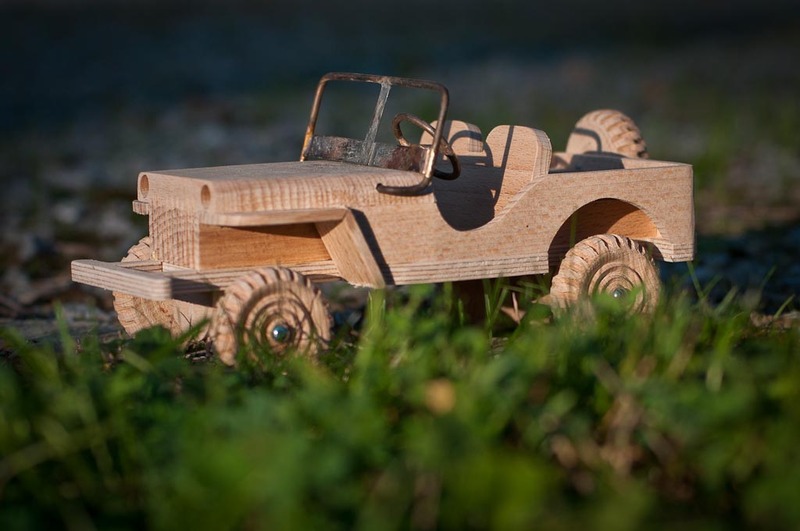 The big news is that Kari Enzmann has revived not only the wooden Jeep toys, but also the sports car that his father used to build. 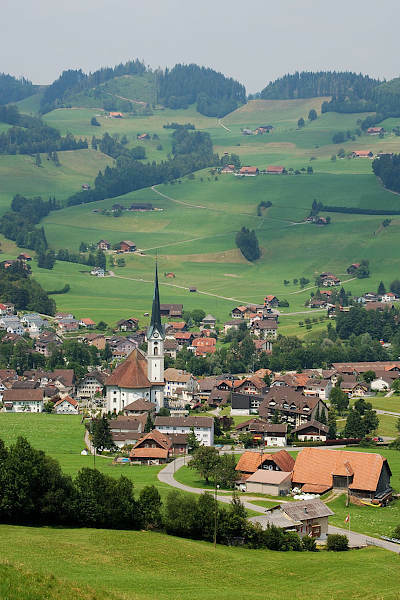 More information on the brand new version is available at Enzmann 506. See also Matt Sanchez's article A Little Bit Of History Repeating.. 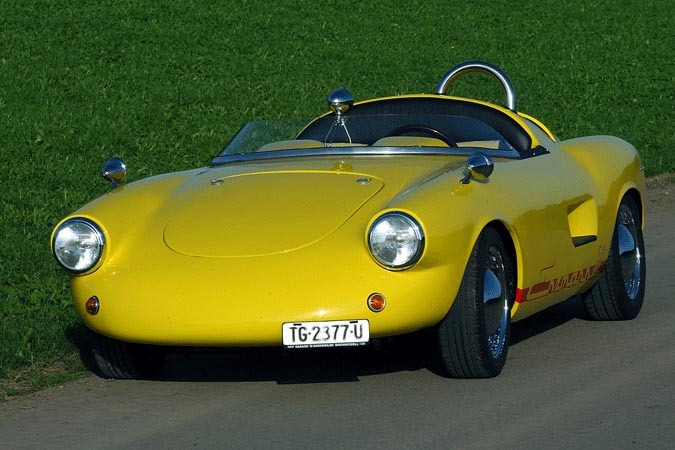 The Enzmann 506, and Bruno von Rotz's post at The Driving Philosopher. 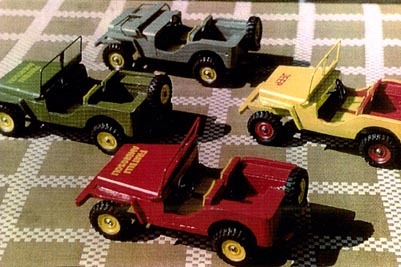 Return to the Toy Jeeps Pages on CJ3B.info.